BELLEVUE, Wash. & CHICAGO--(BUSINESS WIRE)--Symetra, a national provider of employee benefits, annuities and life insurance, awarded Thomas Jefferson Junior High School in Woodridge, Illinois, with a $20,000 Symetra Heroes in the Classroom® “MVP Award.” The education grant will fund “Learning through the Lens of Equity,” a multi-pronged approach to supporting equity in education that seeks to connect Jefferson students to the curriculum, classroom and community. The program will help ensure that all literacy classrooms have texts that appeal to a culturally diverse population of learners and provide staff with training around cultural sensitivity, consciousness around race, and help set the stage to begin having difficult conversations around implicit bias, prejudice and the power of words. “Learning through the Lens of Equity” was announced as the grant recipient during an April 5th luncheon at Halas Hall celebrating the 16 Chicago-area teachers recognized as Symetra Heroes in the Classroom during the 2018 NFL season. George H. McCaskey, chairman of the Chicago Bears, a Symetra Heroes in the Classroom program partner, and Bears offensive lineman Rashaad Coward visited with the teachers, who were accompanied by their school principals. Symetra Heroes in the Classroom honors K-12 teachers for educational excellence and offers each of the 16 schools with a teacher-Hero the opportunity to submit an MVP Award proposal. Nominated programs are evaluated on a range of criteria, including innovation, feasibility and demonstrated need. “Symetra is proud to act as a catalyst for innovative programs that benefit community schools. ‘Learning through the Lens of Equity’ helps meet a critical need in a positive, proactive way. We believe that by promoting a classroom environment that embraces diversity, everyone benefits,” said Sharmila Swenson, AVP, Public Affairs at Symetra. “Together with the Chicago Bears, we applaud educators like those at Jefferson Junior High who are supporting inclusion, equity and excellence for all students — they are the true MVPs.” Swenson and Symetra Community Relations Assistant Director Tracy Wort presented the award to Jefferson Junior High School Principal Justin Warnke. “Learning through the Lens of Equity” hopes to address inequities in access and resources for underserved student communities. Jefferson Junior High identified a student achievement gap between African American, Latino, Asian and white students, with white students significantly outperforming their African American and Latino peers in all assessed subject areas. “Learning through the Lens of Equity” will promote literacy and ensure that all students can culturally relate to a character in a book they are assigned to read. Supplying students with culturally diverse text sets where students can see themselves increases student engagement in reading and so builds capacity to process text in all subject areas. By enhancing student engagement, connecting students to literature, increasing the level of questioning, and promoting critical thinking through rigorous classroom discussion techniques, “Learning through the Lens of Equity” will help increase student performance on school-based, local and standardized assessments. Symetra has partnered with the Chicago Bears on the teacher-recognition program since 2010, honoring 144 area teachers to date. The company established Symetra Heroes in the Classroom® in its Pacific Northwest hometown in 2006, has recognized 600 teachers nationwide and contributed more than $1 million to schools for classroom books, supplies, and in support of student programming. Teachers may be nominated by their principal, district staff, student or student’s parent. The winners are selected based on their ability to make a real difference in students' lives; to go above and beyond in their day-to-day responsibilities; and to help students build life skills. 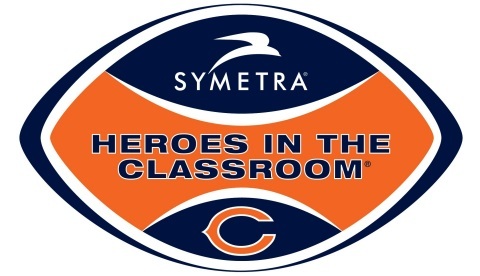 More information about Symetra Heroes in the Classroom is available at www.SymetraHeroes.com/Bears. 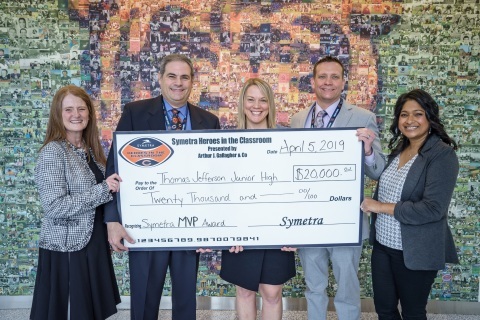 Symetra presented the 2018 Symetra Heroes in the Classroom® MVP Award to Thomas Jefferson Jr. High School in Woodridge, Ill.